DUBLIN, Ga. — Several hundred people attended a rally on Friday in support of the right to pray inside of a Georgia mall after a women’s power walk group had been stopped from praying by security last month. As previously reported, Dublin Girls Run has been meeting at Dublin Mall each week since November of last year for a power walk, and opens each meeting in prayer. But the women state that a few weeks ago, their weekly prayer was interrupted by a security guard who advised that they needed to discontinue the practice. “The security guard came running toward us and said, ‘You are not allowed to pray at the mall. That’s against the policy,’” group leader Tammy Brantley told Fox News reporter Todd Starnes. The guard advised that the mall had taken issue with another group “proselytizing” shoppers, but the women noted that all they were doing is praying quietly. They asked to speak with the manager, but he made similar statements. “The mall manager verified that prayer is not allowed at the mall because this is private property,” Brantley explained. However, after the matter made headlines, MCK Properties, the owners of Dublin Mall, stated that mall employees misunderstood the rules and that MCK Properties takes no issue with prayer at the establishment—as long as it is not “imposed” on the shopper. “The mall first and foremost has no issues or objection whatsoever with anyone of any religion denomination privately and quietly praying over there food before they eat or showing devotion towards their religion of choice provided it does not impose itself on others or take away from the overall shopping experience,” John Engler, vice president of MCK Properties, wrote in a statement. “The information might have been not communicated properly and we’ve certainly handled that internally with our management and we apologize for that,” he added to reporters last week. 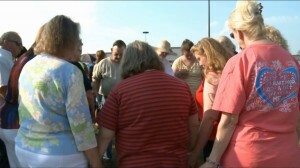 On Friday, a prayer rally was held at Dublin Mall in support of the right to pray. According to reports, over 300 area residents attended. Some held signs at the event, such as “honk for Christ,” some delivered speeches to those gathered, but most of all, the group joined together to pray. Brantley told local television station WMAZ that she was overwhelmed by the support.